I flew to New York Monday morning and right into a rainstorm. I thought I would be leaving gray skies behind when I left Portland but the weather gods have decided to torment me a bit. I’m always struck by what a living entity this city is. So vibrant, so alive, so crowded, dirty and diverse. I love it. I can’t picture myself ever calling this my home but it’s pull is undeniable. At this moment I’m sitting in the Nomad Hotel having dinner. Surprisingly I made friends with the couple having dinner next to me and they made me feel less awkward about dining alone. There is something scary about dining alone. Feeling self conscious is a state I find myself in frequently but I will say there is something liberating about having only yourself for company. There is no one to blame if the evening isn’t what you want, you and only you are in charge of the outcome. People tend to be more open and kinder to those that are dining alone. It’s easier to strike up a conversation and make a connection when you are solo. I’ve had a few great meals and a few mediocre ones but it’s been fun exploring the city in a new way on my own. No timelines to follow, no people to please. I’ve been aimlessly wandering and just taking it all in. My friend Erin is flying in tomorrow and I know the rest of the trip will be full of adventure. I’m looking forward to exploring the city with her and eating our way through Manhattan. Before I left Portland I was inspired by all the New York restaurant websites that featured beautifully crafted plates. I decided to create my own art on a plate. The ingredients in this salad are minimal and simple but I think they make a stunning presentation. 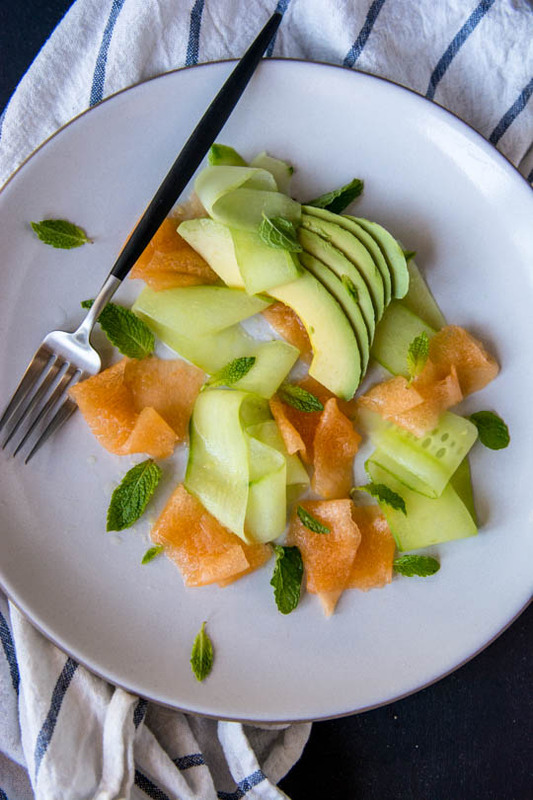 Thinly sliced cantaloupe and cucumber are tossed in a dressing of ginger, honey and lime and then topped with thinly sliced avocado and fresh mint. 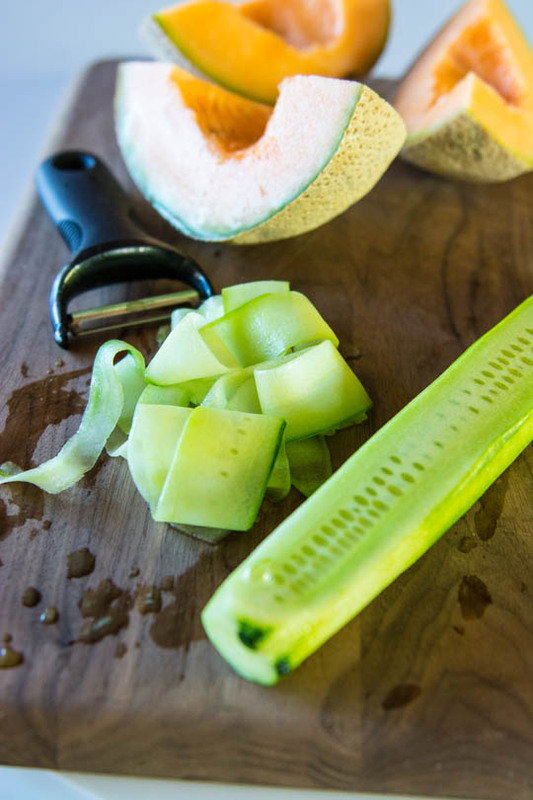 I used my hand held julienne slicer to make thin ribbons of the cantaloupe but if your melon is overly ripe it will be difficult to slice it thinly without having it fall apart. 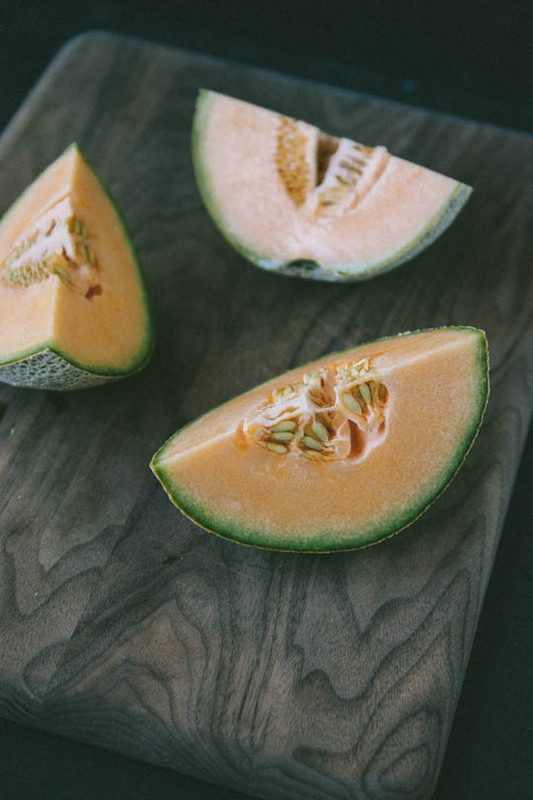 Pick a melon that is firm but fragrant and you shouldn’t have any trouble. I let mine languish on the counter for a few days and it was a little tricky. I feel like I’ve featured mint in most of the recipes I’ve posted lately but I just can’t get enough. If you don’t care for mint, Thai basil would also be a lovely choice. Presentation is important to me. I firmly believe that we eat with our eyes first. I guess it’s the photographer in me but when a dish is appealing to the eye I can’t wait to eat it. I take a lot of care with the way I craft a plate, it’s my favorite part of cooking. 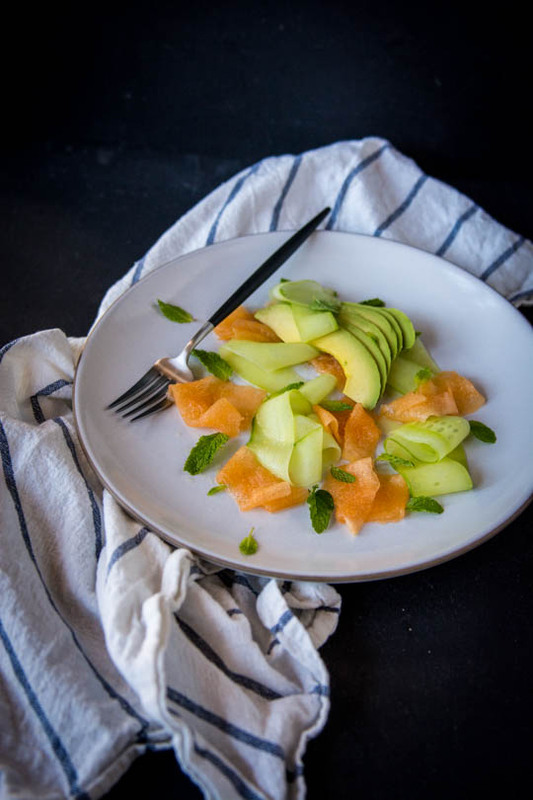 You could just cube the melon, cucumber and avocado and toss it in a bowl with the dressing but I feel like slicing the ingredients thinly allows you to compose the perfect bite and enjoy how delicate the salad is. My dinner is arriving so that’s all for now. I’ll be back on Friday with highlights from my trip and some of my favorite New York finds. Have a great rest of the week! 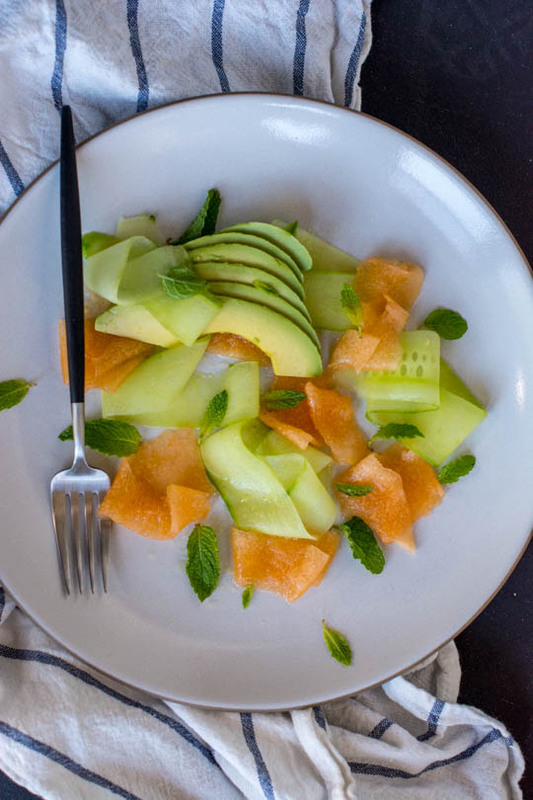 This is the perfect salad on those days when the summer heat is getting you down. Light and fresh this would make a great salad for a party or barbecue. 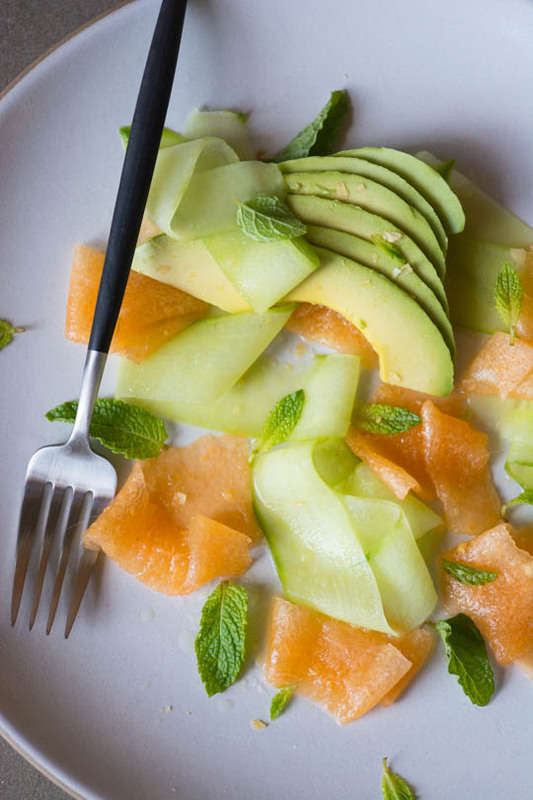 Using a vegetable peeler or mandolin, slice the melon into long ribbons. Repeat with the cucumber, stopping when you hit seeds. In a small bowl, combine the lime juice, honey, olive oil and ginger and season with salt and pepper. 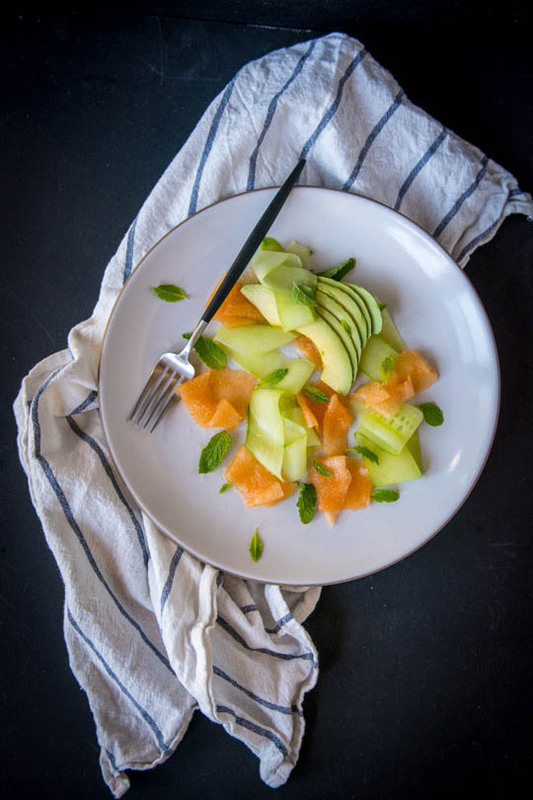 In a large bowl toss the cantaloupe and cucumber with half of the dressing and then divide among four plates. Cut the avocado in half, remove the pit and gently peel the skin away from the flesh. Slice the avocado into thin slices and fan out on top of the salad. Drizzle remaining dressing over the top and scatter the mint over the top.